ARTICLE: Colonial Fox acquires National Bank building . . . Read more. ARTICLE: The Colonial Fox Theatre Foundation has taken over ownership of the National Bank Building . . . Read more. EVENT: Local Poets read in Wichita, Saturday Nov. 5 at 2:00pm . . . ARTICLE: Paranormal investigation team visits Colonial Fox Theatre--The Colonial Fox Theatre Foundation almost didn't schedule a paranormal investigation . . . EVENT: SOLD OUT! Saturday October 29, 9:00pm Haunted tour of the Colonial Fox with Jasper Haunts Paranormal team! EVENT: Friday Flix "Beetlejuice" will screen on October 21 at dark. EVENT: October 9 -- Last Second Sunday tours from 2-4 pm. EVENT: October 7 -- Fall Art Walk featuring "The Barows"
EVENT: CANCELED due to rain "Toy Story 3" September 16. ARTICLE: Sunday's Little Balkans Days Festival events capped off one of the best weekends in the festival's history . . . EVENT: Second Sunday Tours, September 11 from 1:00pm - 3:00pm. MEDIA COVERAGE: KOAM invites CFTF for an interview about Tallgrass Film Fest. & progress update! ARTICLE: Pittsburg resident Joy Reed and her friend Gayle Callahan used to go watch the Rocky Horror Picture Show at Grubbs Hall . . . EVENT: Sunday, September 4--Tallgrass Film Festival Road Show to premier at 8:30pm at the Colonial Fox Theatre. Festival screenings will run through 2012 will be hosted by several Kansas Historic Theatres. Click here for more information. EVENT: Saturday, September 3--Little Balkans Day Tours 9:00am - 12:00pm. Limit 25 to a group, $3 donation appreciated. EVENT: Friday Flix Series continues August 19 with "Rocky Horror Picture Show!" . . . EVENT: Second Sunday Tours begin August 14 from 1:00pm - 3:00pm . . . EVENT: Friday Flix Series continues with "The Princess Bride" . . . EVENT: "Creating the Future" LHAT's 35th Annual Conference held in Schenectady, NY, will take place in the city's historic Proctor's Theatre. The event will include workshops on programming, marketing, fund raising, facilities operation and many more topics crutial to the restoration of historic theatres. EVENT: June 17 - Friday Flix Series continues with a special showing of "Stagecoach"
EVENT: Friday Flix season opener cancels due to wide-spread thunder storms. The Colonial Fox Theatre Foundation staff reluctantly called the showing of The Sting amidst driving rain in the downtown district. Radar shows Pittsburg surrounded by thunder storms. Unfortunately, The Sting will have to wait for another season. EVENT: 2011 Friday Flix Season opens May 20 with The Sting. Show will start at dark. Rain cancels. EVENT: The Great Plains Traveling Vaudeville Show world premier. Saturday, May 14, 2011 at the McPherson Opera House. 7 p.m. EVENT: The Kansas HIstoric Theatre Association"s (KHTA) 2011 second quarter meeting will be held at the McPherson Opera House on Saturday, May 14 at 3 p.m. . . ARTICLE: Colonial Fox welcomes new letters - The historic and beautiful Theatre of Lombard, Ill., was demolished May 14, 2007, despite the efforts of devoted friends to save it. VIDEO: "A Gift From One Historic Theatre to Another." The Colonial Fox Theatre receives a donation of marquee letters, once used on the Dupage Theatre in Illinois. EVENT: Friends of the DuPage Theatre in Lombard, IL, Lillian and Paul Mundt, deliver a set of marquee letters saved from the demolition of their theatre. ARTICLE: Sister theatre to deliver marquee letters to Fox. Come Monday, it will be easier for the Colonial Fox Theatre Foundation to spell out for the public what's been done or what's coming up at the historic theatre -- literally. ARTICLE: The Commission approved the $7,500 grant, which will be used for east and west facade improvements, as part of the meeting’s consent agenda. ARTICLE: The Colonial Fox Theatre Foundation and Memorial Auditorium staff are requesting approval from the city for grant applications at tonight’s city commission meeting. 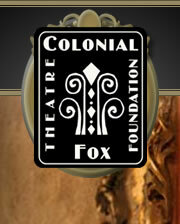 ARTICLE: Colonial Fox Receives $500K Grant. "There are things in life that deserve to be funded." ARTICLE: Now it's History -- "When a new phase of restoration begins next week at the Colonial Fox Theatre, the sign out front will read: “Funded in part by Save America’s Treasures program." EVENT: The Colonial Fox Theatre Foundation will be partnering with the Pittsburg State University Department of Construction Management and Construction Engineering Technologies and Sika Corporation to present a seminar on fiber reinforced polymers (FRP) used in construction on Tuesday, March 29th, at 7pm in Room S102 - Auditorium of the Kansas Technology Center on Pittsburg State University's campus. This is a very exciting collaboration of Non-Profit Corporation, Higher Education, and Industry and we are pleased to be able to bring it together. EVENT: Annual Meeting and Awards Ceremony (and the CFTS's 91st birthday), at 6:30 p.m. in The Corner Bistro. We will not only present our Most Valued Volunteer Awards and our very special Ralph E. Wallace Award for Volunteer Excellence, but we will also preview our new website and the exciting plans and panoramic color image that we have received from Westlake Reed Leskosky. Kansas Senate will vote to stop the governor’s ERO to disband the Kansas Arts Commission.